ARE YOU SEARCHING FOR THE BEST GMAT COACHING IN BANGALORE ? I was nervous, I knew the answers but lacked time, Time management and problem solving shortcut methods are necessity. Heard or felt like any of the above? Are you looking forward for an MBA programme to study abroad? Wrote an exam earlier and want to score better? If you have written an exam then you can skip the following paragraph, if not then hang on and read. You will have to ace one part of entry criteria – “Graduate Management Admission Test” also popularly known as GMAT. One of the most recognised and accepted Test by more than 6,000 International Universities in different countries. GMAT is used by most of the business schools to assess your performance for an MBA admit. According to the council, GMAT assesses your analytical writing and problem-solving abilities, while also addressing data sufficiency, logic, and critical reasoning skills that it believes to be vital to real-world business and management success. Your scores are provided based on your ability and potential for academics. Details regarding payment methods or to postpone exam date/ reschedule/cancel exam /reporting of scores click here. If you reschedule or cancel within or after 7 days there are certain charges towards them too. NOTE: Additional score report costs $35. How to book a date for GMAT exam: You can log on to MBA or click here to schedule a date. There are various study materials available for GMAT preparation. Manhattan PREP is considered the BEST MATERIAL FOR GMAT. But under guidance for GMAT Coaching in Bangalore you are trainer by our expert staff to score the best since you are trained by a professional who has secured rare and enviable score of 780 and has successfully established her career. Professional and experience trainers pilot your path with keys and shortcuts. If you have to get an unbelievably good scores, you have to spend no more than 2-2.5 min over a question. You are taught the GMAT Exam tips and tricks to tackle the questions with focus on time management since personal watches and clocks are prohibited in the exam centre. Whether you are left with 5 months or 5 weeks for your exam and we have customized material and coaching services for all types of students. If you have taken the GMAT coaching in Bangalore earlier and the desired scores were not met what were the reasons of low scores? Felt rushed or nervous? Struggled with certain areas or felt you had to know better techniques to tackle the questions? You are reading the right page. 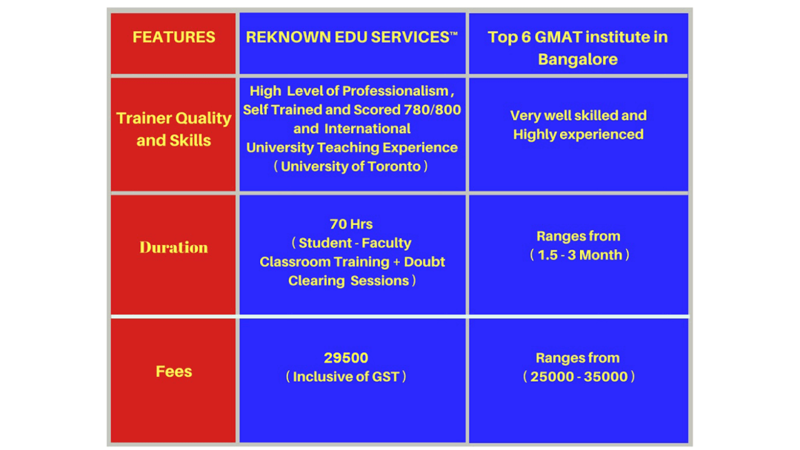 At REKNOWN EDU SERVICES GMAT coaching in Bangalore costs you a market competitive cost of ₹ 25,000+ GST for the entire 70 hours. You can undergo free trial GMAT classes coupled with free mock session every fortnight. Typically, the GMAT assesses your Quant & Verbal skills and you have 4 separate timed sessions. You can take 2 optional 8-minute breaks. The total exam duration is for 3.5 hours, GMAT EXAM duration shortened by 30 Minutes compare to last time. 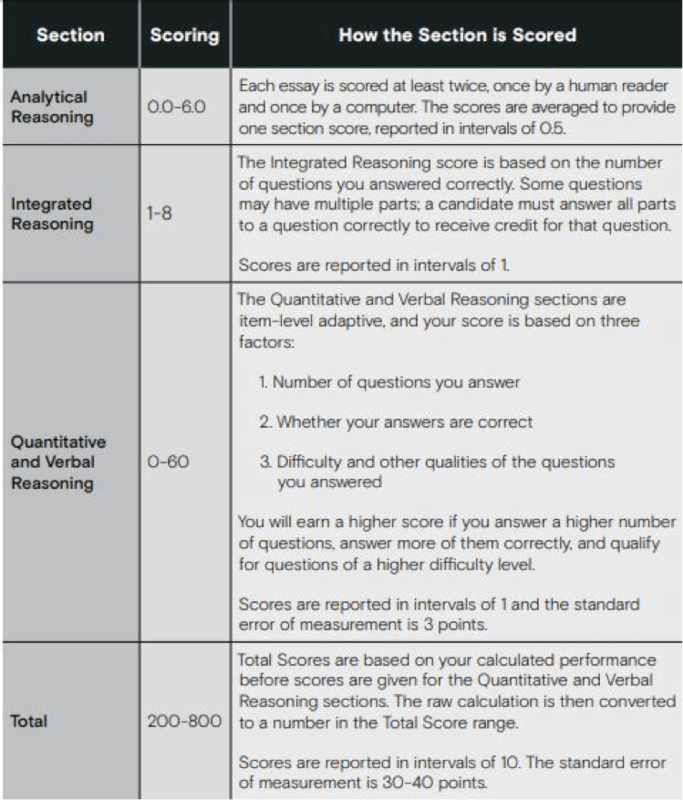 The Quantitative Reasoning and Verbal Sections of the GMAT exam are adjusted to test taker ability and both multiple-choice and are monitored in the computer-adaptive format. At the start of both sections, test takers are presented with a question of average difficulty. During the course of test, the complexity of questions level increase with every right answer and with every wrong answer the level of difficulty decreases. This process continues until test takers complete each section. At this point the computer will have an accurate assessment of your ability level in that subject area and come up with a raw score for each section. Since GMAT is all about assessment of your skills. After previewing your unofficial GMAT score, you have 2 minutes to decide to keep or cancel your GMAT score at the GMAT test centre. If you wish to, you can also cancel a score online within the 72 hours after the scheduled exam start time. If you wish to reinstate your cancelled score, the same can be after 4 years and 11 months after the date of the GMAT test for a fee of $50. 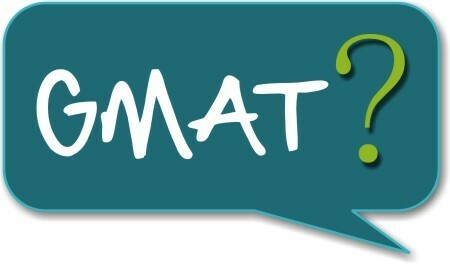 For more out of the box FAQ related to GMAT, click here. You can log in to Official Web page of GMAT and report your GMAT score s to institutions. You will be charged $10 for each institution.